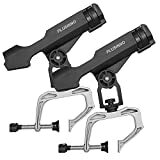 Cannon Downrigger Rod Holder is a dual axis fishing rod holder that mounts between the mounting base and swivel base of your downrigger rod holder for the ultimate positioning of the rod. A fast grip release enables you to change the angle with just one hand and quickly. The adjustment system is innovative allowing you to pull the holder to a vertical position. 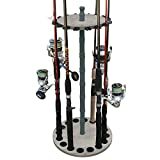 Cannon fishing rod holder rotates a full 360° which adds more versatility. This is Compatible with all Cannon downriggers (excluding Mini-Troll). These fishing rod holders for the boat are 10 inches long. 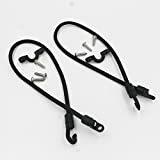 Let us now move to the specification part of Cannon Downrigger Rod Holder review to know more about these downrigger rod holders. 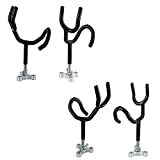 Exclusive three position configuration of Cannon Downrigger rod holder delivers fast bait cast or spinning rod pickup. Its 360° swivel base can be top or side mounted - port or starboard. It prevents reel from shifting during storage with a slotted rear cradle. There is spring loaded knob which allows you to adjust your rod very quickly and conveniently. It fits all downriggers with booms up to 8' length. As we mentioned earlier, the spinning rods sit awkwardly. To get rid of this, you can quickly put the spinning reel on top and slide in the rod upside down to secure it. Indeed, it should not be a problem for your baitcasting reel. Overall, we found we found this downrigger rod holder of great use. So, we recommend this rod holder for your next fishing trip. UNIQUE- A KastKing fold flat rod rack is the perfect addition to your fishing gear for fishing rod storage. 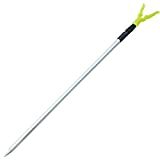 For fishing rod handles one inch or less in diameter, openings are 1 1/8 inch . 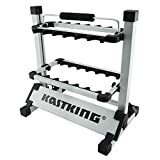 CONVENIENT- unlike other fishing rod racks, the KastKing Fold Flat fishing rod holders will easily fit in a tight spot for storage or during travel. Great for camping or kayak fishing trips. DURABLE - made of aluminum and corrosion resisting material, this fishing rod holder will last a lifetime. Great for bass fishing rods, trout rods, fly fishing rods and smaller combos. 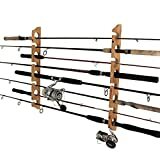 GREAT VALUE- a KastKing rod rack offers convenience and more features at a great price compared to a conventional fishing pole holder or fishing pole or fishing pole wall rack. AWARD WINNING DESIGN - KastKing Rack Em Up fishing rod racks won a Best of Show Award for their innovative design at ICAST(International Convention of Allied Sportsfishing Trades) among hundreds of fishing tackle competitors.